With the popularity of parabens being bad, it is important to note that their are many other preservative ingredients to watch out for as well, we have a list of ones to watch for. The FDA allows the use of parabens in skincare, but you will want to make your own decision as the research over this topic is still discovering how parabens effect your health. Parabens have been used for over 80 years to preserve your product and inhibit bacteria, fungus and other microbes that can form in mostly bathroom products. Before the 1930's, formaldehyde was used as a preservative. These products sit in a moist warm bathroom and contact your skin on a daily basis that can contaminate and bring on growth of bad bacteria and fungus. 44% of cosmetics contain parabens (1) including Deodorant, shampoo, conditioner, lotions, lipstick, mascara and other makeup have been known to contain parabens. Some food also contain parabens such as jams and jellies. Parabens have been found to mimick estrogen, absorb through skin, have been found in breast cancer tumors, increase testicular cancer, can disrupt the endocrine system, and lower sperm count. A study where lotion with parabens was used on the body showed that two hours later parabens were found in the urine samples. Most breast cancer is in the upper outer areas of the breast, close to where deoderant is applied, giving some indication it plays a role in breast cancer. 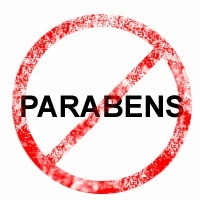 Parabens are not metabolized by your skin, and over time of use will accumulate on your skin. This can result in eczema, irritation and rashes. Studies from Kyoto Prefectural University of Medicine in Japan found that when parabens were applied to the skin in normal amounts and then exposed to ultraviolet light (UV), 19% of skin cells died, where as only 6% died to skin without any application. This results in wrinkles, age spots, reduction in collagen and elastin, and an overall aging of the skin. Lipid peroxide levels were also three times higher with the skin that was exposed to parabens, an oxidizing aging process where free radicals "steal" electrons from lipids in healthy cell membranes. At shopspaViolet.com we have made a section of paraben free skincare, we have scoured the ingredients for you. The ingredient names for parabens will end with "paraben", like butylparaben, ethylparaben, isobutylparaben, methylparaben ( Methyl P-Hydroxybenzoate ) and propylparaben. We have made a list of other harmful preservatives in skincare, and also a list of safe and healthy preservatives in skincare. 1 Yazar K, Johnsson S, Lind ML, et al. Preservatives and fragrances in selected consumer-available cosmetics and detergents. Contact Dermatitis. 2011 May;64(5):265–72.